Steem has a wide variety of dapps, but not all dapps have a Android app. 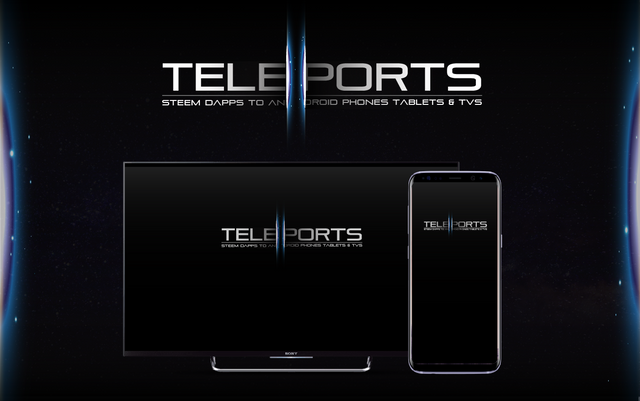 The Teleports project creates and releases mobile apps, that display the dapps site in a themed android app, and give the users a alternative way of playing and using the Dapp project, with the use of Teleports unofficial mobile apps. Apps on our Android devices help to interact faster and more often, and they bring a richer user experience, and because of this it advertise Steem and the dapps on those devices and brings the dapps and Steem to a bigger audience at the same time. The Teleports project is a revival from the before created Steemport project, they both have the same goal of bringing more apps to the Steem blockchain, but the before project was made with MIT app Inventor and that comes with limitations, and the renewed and re freshed project Teleports will make use of Android Studio which is more versatile. The created android apps will show the official dapp website inside a Android app, though the apps will be tested on functionality before release, and bugs will be hunted and fixed where possible, the taken approach of showing the dapps also brings with it limitation. On the other hand this approach also brings a benefit because when the official dapp sites are updated (layouts/functions/articles/etc) these will be instantly available in the previously released unofficial mobile apps by Teleports. Contact with the dapp makers further helps to get the best working unofficial apps, and could result in official app releases. The released apps will be displayed on the Teleports website where they are showcased and made available for download, the apps itself also link to the Teleports website. 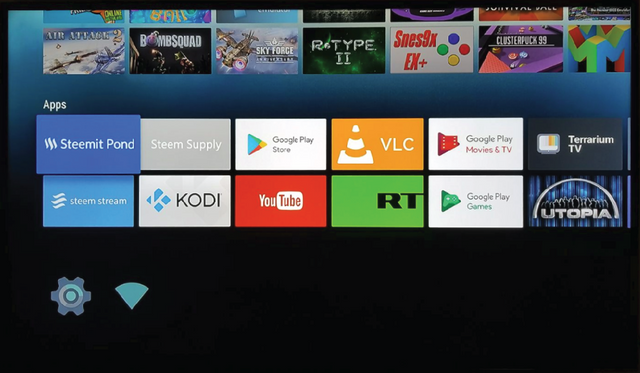 Released apps will be made compatible for Android phones, tablets and last but not least Android TV, which brings Steem to the biggest screen in our house. The above points are on scheduele and more things to improve will come along the road. The new and very popular game DrugWars will be the first Teleports mobile app, and the first version will be released soon. the test results are good and it is is very usable and engaging to play as a mobile app, and i prefer to use it "when on the go" for some time now. To ensure the most optimal experience i'm in contact with @hightouch to let him know the results and possible issues. Preview on Android TV of the first Teleports App, Drugwars. The released Teleports apps are free to try, but if you like and use them on a regular base, and want to help the further development, then please donate 2 or more STEEM with Fundition or send it in a transfer to @teleports and you then are free to use it as often as you want. The generated funds are used to dedicate more time and work into the development of the project and in releasing more apps. I doubt that I'll use it but U do an awesome job mate!!! Thank you for your reply and resteem, using the dapps as a Android app is a faster and more easy way to interact with the dapps. i like to use this alternative approach, and it can bring Steem to more devices, users and places. Does that mean that this takes the official app name on the application store? while still being an unofficial app? if so, how would you free the name if the official app wants to come? How does this work on a "copyright" base? Could you clarify that authorization from the developers has always been received beforehand? How does this work with purchases made from the app itself? are they sent 100 % and you just rely on the 2 STEEM support? Is this just a webview? what other features than a webview is there? what do you add to it currently, and what is on the roadmap? I would suppose Apple review system would refuse such unofficial apps, so that's why it does not land on iphone. I was really surprised to see an "official approach" to feature contents from other developers in a webview system. I come from regular publishing systems so my surprise must come out from this. Overall I believe the blockchain, the communities, and better access to app features all fit into what you are proposing! so I am sorry if my questions come as a surprise, but I am really inquiring into the authorization process, if cooperation has already been settled with the devs beforehand. Again, sorry for the confusion but I believe the news would warrant such questions.